Diamond Home Support has been listed in the Top 100 Franchises for 2019. A great way to start the new year! Furthermore, we are the LOWEST priced franchise in the entire UK top 100. So there truly has never been a better time to join Diamond Home Support. We held one of our regional meetings in Nottingham on 16th October. We had a good turnout from our Midlands based franchisees. We all enjoyed a day of exchanging ideas and best practice. It’s been quite a six months for us at Diamond Home Support. We have already taken on more franchisees this year than we did in the whole of 2017. We recently took on board 4 in just 4 days! If you’e looking for a low cost cleaning franchise that delivers results then look no further. Take a look here for more information and then download our prospectus. 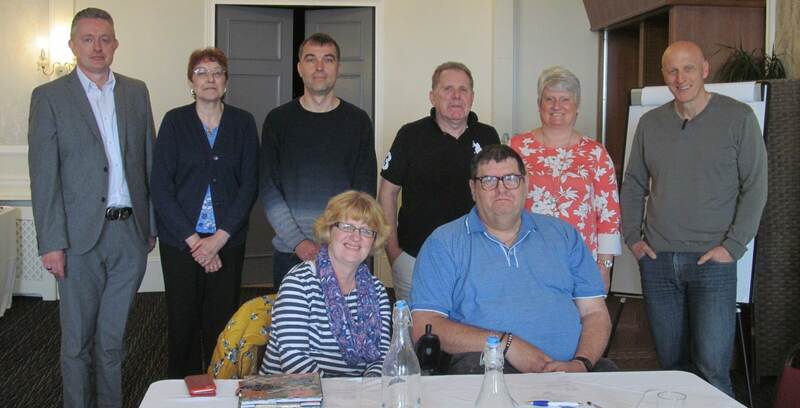 We held our South West Regional meeting on 27th April 2018 in Torquay. We had a great turnout with most of our south west franchisees represented. We all enjoyed a day of exchanging ideas and best practice. 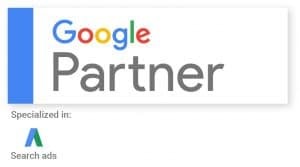 Diamond Home Support achieves Google Partner status – normally something only digital marketing agencies achieve. It demonstrates our commitment to developing the modern marketing strategies required to operate a successful service-based business. We are pleased to report that we have achieved Member status within the Approved Franchise Association. The AFA is an industry self-regulatory body. It demonstrates our commitment to our franchise network and to abiding by the Code of Ethics from the European Franchise Federation. 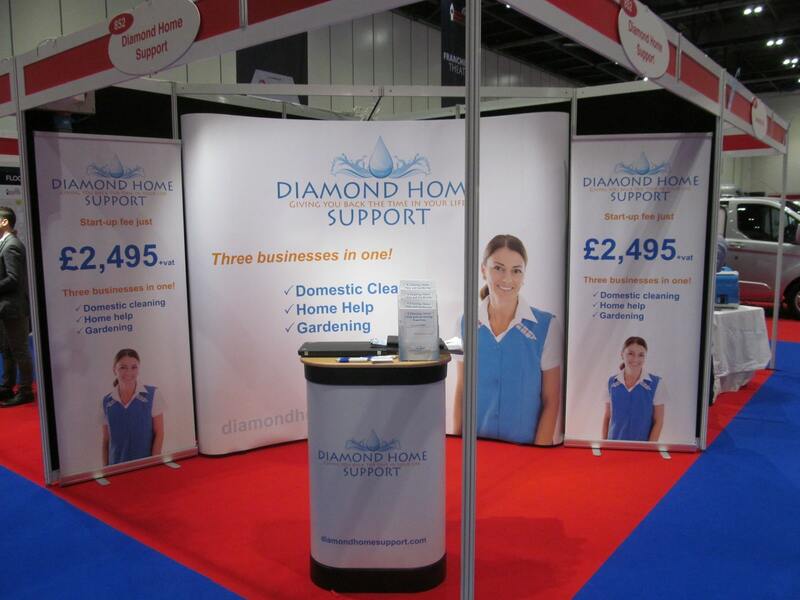 Diamond Home Support has just returned from 2 successful days at The Franchise Show in London. We spoke to an endless stream of potential franchisees interested in what we have to offer and we hope a number may well to choose to join us. The quantity and quality of leads was good and we thoroughly enjoyed talking to so many people about our business. We will be exhibiting at The Franchise Show, ExCel, London on Friday 17th and Saturday 18th February 2018. Free tickets – come and see us on stand 852. Very many congratulations to our 2017 award winners! 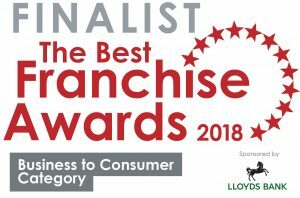 Could you be winning our new franchisee of the year award for 2018? Find out more about our cleaning franchise business. Our Head Office continues to receive calls from clients who need a cleaning service in areas of the UK that we do not currently cover. We need new franchisees to cover those areas to take advantage. If you have the investment and time required then we’d love to hear from you. In exchange we will show you how to replicate our business and start benefiting from the rising demand for domestic cleaning and home help services. The first step is to download our prospectus. Great basis for starting a cleaning business. We held our Northern Regional meeting on 16th May 2017 in Manchester. We had a great turnout with most of our northern franchisees represented. We all enjoyed a day of exchanging ideas and best practice. Our franchise package has been increased this month. We now provide 50% more leaflets (15,000) and 100% more Google Adwords advertising (6 months) for new franchisees. All of this for a start-up fee of just £2,495+vat. Diamond Home Support’s Managing Director has now acquired Google Certified Adwords Professional status following passes at the required exams. This means in-house Google Adwords advertising has been acknowledged as being conducted by an expert in the field. Diamond Home Support launch a brand new public website and a new Franchisee Intranet. These results clearly demonstrate that low cost, low risk franchising works! On Tuesday 8th November we held our Annual Meeting at the Hilton Hotel in Maidstone. We shared in success stories across the network but particularly our award winners. We recorded record website visitor figures during June, now we have experienced record numbers of calls to our call centre during July. In June our website recorded its biggest one day set of visitors, and its biggest set of weekly visitors, AND the biggest monthly visitor figures we have ever had! That’s the kind of demand we are currently experiencing. 13 people have joined the Diamond Home Support cleaning, home help and gardening franchise network since the start of 2016. Let us tell you why. Recent research has shown that almost one in ten people in the UK have a domestic cleaner. That is a 24% rise in just 5 years. The rise in demand appears to have been driven particularly by the under 35’s. Almost twice as many under 35’s now have a cleaner when compared to over 35’s. The research suggests that the rise in demand for domestic cleaners is because: they work long hours; they have a busy social life; or they want the job done properly. Sounds like a reasonable basis to consider running a cleaning business! March 2016 – Surge in the demand for domestic cleaners – so says research! Recent research by the insurer esure has shown a huge rise in the demand for domestic cleaning services over the past 5 years. The research shows that nearly five million people now have a cleaner – that is an increase of 24% compared with 2011. Working long hours and a busy social life are amongst the reasons given for this rise in demand. Is it any wonder therefore why the domestic cleaning business is the one to be in right now! March 2016 – Bespoke Diamond Online Database Application Launched! Diamond Home Support now has its own bespoke online database application. Franchisees can now do much of their administration through our bespoke online application. February 2016 – 7 Franchisees in 7 Weeks! Yes we have had a terrific start to 2016 with 7 franchisees joining our network in the first 7 weeks of the year. Why has this happened? In simple terms it is because 7 people have realised the significant potential there is in running a Diamond Home Support franchise business. 1. Domestic cleaning is a genuinely in-demand service. No longer is it seen as a luxury. Oh no, for many it is now a necessity and something they would not and could not do without. For the busy family it gives them time at the weekends together. For the stressed, hard working professional, it gives them something less to worry about. For the elderly, it means they can relax in the knowledge that others can now do for them what they can no longer do. 2. Our franchise business model includes three revenue streams. That is: cleaning; home help services; and gardening. Our new franchisees recognise that this is effectively three businesses in one. In our home help service we are tapping into a gap in the market where demand is rising and where the competition is still relatively low. 3. Our start-up fee is low compared with the sector average. Indeed for many this initially is concerning. Will I get everything I need? Will I get the support and training? Am I going to be missing something that I would get if I paid £5,000 or £10,000 for a similar business model? All of these concerns are frequently shared with me by people like you. In the last 7 weeks, at least 7 people have spoken to me and realised – hey yes in fact you do get a complete package, training and full support. We don’t leave anything out. So rest assured. The money you save when you join us is just that – money saved in your pocket. 4. They recognised that our monthly fee is fixed and relatively low for the sector. That means we don’t take a percentage of your turnover. As your business grows you get to keep more of it. Over the lifetime of a business that can mean thousands of pounds saved. Our recent joiners recognised and appreciated this point. 5. Finally, when joining Diamond Home Support they are joining a family of businesses all supporting and learning from each other. As a franchisor we believe in constantly developing our network of businesses and often this is as simple as holding a mirror up to the network and saying – look this is what is working and this is what isn’t working. 70+ businesses all working together makes for a strong team. Our new franchisees recognise this and see the value in it. 7 people in 7 weeks can’t be wrong! What that also means is that there are 7 territories no longer available that were at the end of 2015. If this has got you thinking why not find out about becoming a Diamond Home Support franchisee in your area. If you would like more information you can download our prospectus immediately here. November 2015 – Diamond Home Support Annual Meeting 2015 was held on 10 November. “This year has been our biggest annual meeting yet with more franchisees attending this year than ever before. This year’s event included a workshop element, presentations from franchisees and an external speaker, Brenda Cameron, who spoke on goal setting and motivation. We also announced our 2015 award winners as follows: Franchisee of the Year went to Connie in Norwich; our Runner-Up award was won jointly by Tim in South Lincolnshire and Astrid and Ian in Callington; our Best Newcomer went to Lynda in Windsor. As usual we had a great time and a day full of inspiration. We very much look forward to next years event.” Andrew Watton, Managing Director. November 2014 – Diamond Home Support holds 2014 Annual Meeting. On 11th November 2014 franchisees from the Diamond Home Support network got together for our annual meeting. The event took place in Sittingbourne with franchisees attending from all over the UK and Ireland. Amongst other things we celebrated our Franchisee of the Year award winners – Astrid and Ian who run our Callington and Tavistock areas. We also presented our Runner-Up award which went to Connie who runs our Norwich and Great Yarmouth areas. Find out what it takes to open up your own Diamond Home Support cleaning franchise business. November 2013 – Diamond Home Support holds 2013 Annual Meeting. On 12th November 2013 franchisees from the Diamond Home Support network got together for our annual meeting. The event took place in Birmingham with franchisees attending from all over the UK and Ireland. Amongst other things we celebrated our Franchisee of the Year award winners – Sue and Ian who run our East Devon area. We also presented for the first time a Runner-Up award which went to Brian who runs our Stoke-on-Trent area. April 2013 – Diamond Home Support announce another new business extension module for their franchisees. From May 2013 franchisees will be able to offer gardening services in addition to the existing cleaning, ironing and Home Assist Service support. This provides our franchisees with three separate revenue streams all for the same low price. Managing Director, Andrew Watton, said “When I set out to create a cleaning franchise I wanted to do things differently. I wanted to re-balance the risk that franchisees are exposed to and create a model that represented a much better business proposition for potential franchisees. This I did in two ways. Firstly, by reducing the financial exposure with low start-up costs and low ongoing fees. This has been achieved and means our franchisees’ financial risk has been lowered. Secondly, in addition to reducing financial risk I wanted to increase earning potential. We want to offer more services to more people. The introduction of the Home Assist Service in January 2012 was an important part of this process. Indeed such is the potential within that service that we could easily have launched that as a separate stand alone franchise. Now we intend to go further by introducing our gardening service. Again, we could have considered this as a stand-alone franchise, but as with the Home Assist Service, we will be providing it to all Diamond Home Support franchisees at no extra cost. So our franchisees will shortly have three separate service areas: cleaning, home support and gardening. That’s three separate revenue streams.